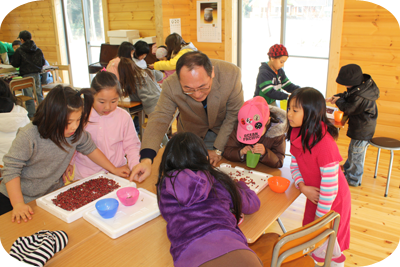 At Tsukuba International School, we have a large garden that is tended by our principal/chief gardener, Mr. Kano. 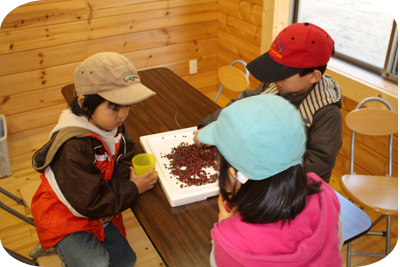 We had a wonderful crop of red (azuki) beans this year, and Mr. Kano suggested that we use the beans to raise money for helping Haiti recover from the massive earthquake that struck the country on January 12, 2010. Since we couldn’t send the beans directly to Haiti, this seemed like the next best thing! 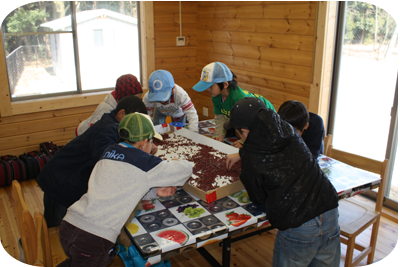 On January 29, students used their lunch hour to sort the beans into piles of “good beans” and “bad beans” based on Mr. Kano’s criteria. Then, the good beans were divided up and placed in plastic bags to be sold to the parents. Luckily, we had our annual student-parent-teacher conferences that week, so many parents visited the school and picked up a bag of beans. In fact, we ran out of beans before the week was out, so one family donated a few bags of ginkgo nuts so that the families coming later in the week would also be able to participate. Then, when we ran out of ginkgo nuts, some families just donated money anyway! Here is the letter that we received from the World Food Programme in response to our donation. The help you have just given to earthquake victims in Haiti means we can not only respond more quickly and effectively, but also reach more people in need. We are so grateful to know we can rely on your generous support. Your donation of JPY24,000.00 on Feb 22, 2010 will nourish those already suffering the loss of homes, jobs, friends and family members. They shouldn’t have to suffer from hunger too. The people of Haiti need our help, and together we won’t let them down. You can follow the latest developments on how people are being helped during this crisis by visiting this page. If you are interested in donating to this cause, please click on the banner below. Thank you to everyone who donated their time and money to help the people of Haiti.